Gordon Stoker joined the Jordanaires in 1950, two years after they formed in Missouri. He originally played piano for the group. They caught the attention of young Elvis Presley in the mid-1950s when they performed with Eddy Arnold at the Grand Ole Opry in Nashville. When Elvis Presley burst onto the national scene in 1956 on Steve Allen’s TV show, Stoker and the Jordanaires were with him. 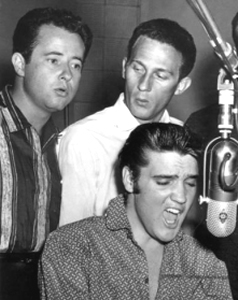 They also sang on the original New York RCA studios recordings of “Hound Dog,” “Don’t Be Cruel” and other hits. For over 40 years, The Jordanaires remained one of the premier backup vocal groups in country music, working with such greats as Jim Reeves, Patsy Cline, George Jones, and, of course, Elvis Presley. The quartet began in Springfield, MO during the late ’40s, featuring original members Bob Hubbard, Bill Matthews, Monty Matthews and Culley Holt, and sang barbershop and spirituals. They debuted on The Grand Ole Opry in 1949. The group changed members during the early ’50s, with Gordon Stoker and Hoyt Hawkins replacing Hubbard (who was drafted) and Bill Matthews (who became seriously ill). In 1953, Monty Matthews left the group for personal reasons, and was replaced by Neal Matthews. 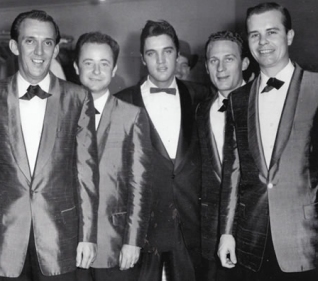 By 1954, the Jordanaires were singing behind artists such as Elton Britt, Red Foley, and Jimmy Wakely. That year they appeared on Eddy Arnold’s television show, but didn’t get their big break until Elvis Presley, a long time fan, invited the group to back him after receiving a major recording contract from RCA Victor. When Elvis became a star, he honored his promise to keep them as his backup singers, and they worked with him until 1970, appearing in many of his films and on his gospel recordings. In 1954, Culley Holt became ill and was replaced by Hugh Jarrett; he left in 1958 and was replaced by Ray Walker. In 1959, the Jordanaires began working with Patsy Cline, and also devised the Nashville number system of chords that is still widely used in recording studios and performances. They also recorded their own gospel and country albums. It was the Jordanaires who provided the main impetus for the formation of the American Federation of Television and Radio Artists/Screen Actors’ Guild in Nashville.